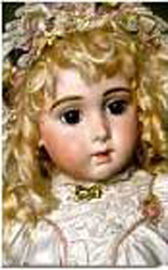 My philosophy on doll repair and restoration is to do only what is necessary. In my Doll Hospital, I restore vintage and antique dolls, specializing in bisque, porcelain, composition, hard plastic and felt. I also work on stuffed animals, some vintage toys. New! We are now making Custom Reproduction Doll Furniture in 1:6 scale for Bleuette, BJD, and other play size 10-12" dolls. Bleuette furniture copied from original G-L Bleuette Furniture and from the La Semaine De Suzette (LSDS) patterns. Being a certified Dollologist means I strive to maintain the integrity of the doll. I have over 12 years of experience and I have 2 certifications in doll repair and advanced doll restoration. I also have a business license. Does the doll doctor you are considering have these credentials? It brings me great joy to restore family treasures and future heirlooms. To thoroughly evaluate your doll, I have to be able to see it and hold it. Pictures and detailed explanations from you are helpful in providing ballpark estimates, but in person evaluations are necessary for detailed and firm quotes. If you live in the Southern California area, please call me to schedule an appointment at 714-785-6998. If you live out of the area, I regularly receive patients via USPS, UPS and Fedex from all over the United States, so please call or email me to discuss the best method to handle your patient. I also offer training classes for basic and advanced doll repair, for those who want to try their hand at fixing their own dolls. Select the Training Classes button to the left to learn more about the training offered. I am a member of the UFDC and a past Vice President of the Doll Doctors' Association. Past Vice President of the Best Little Doll Club of Orange County. Published in the March 2008 issue of Contemporary Doll Collector and the November 2011 issue of Coast Magazine. Check out my auctions on using my User Id, collectmoredolls, and note my excellent feedback.